At home and abroad, in peace and war, Abu Talib, the most respected of Mohammed's uncles, was the guide and guardian of his youth. When Muhammad was 25 years old, his uncle and guardian, Abu Talib, suggested to Khadija, that she appoint him as her agent in one of her caravans, which was ready to leave for Syria just then. Khadija was in fact in need of an agent at that very moment. She agreed and appointed Muhammad as her agent. Khadija was so impressed by his ability and integrity that she decided to put him in charge of all her future business transactions. The expedition also proved to be the prelude of their marriage. Khadija soon rewarded his fidelity with the gift of her hand and fortune. The marriage contract, in the simple style of antiquity, recites the mutual love of Mohammed and Khadija; and stipulates a dowry of twelve ounces of gold and twenty camels, which was supplied by the liberality of his uncle. Abu Talib read the khutba (sermon) of the marriage of Muhammad and Khadija, and his speech proves beyond any doubt that he was a monotheist. He, in the characteristic Muslim style, offered thanks and praised Allah for His mercy and for His countless gifts and blessings; and he concluded by invoking His mercy and blessings upon the newly-weds. The marriage of Muhammad and Khadija was most successful. Khadija dedicated her life to the service of her husband and of Islam and spent all her wealth in strengthening Islam, and on the welfare of the Muslims. Khadija had the same sense of mission as Muhammad had. She freed her husband from the necessity of making a living, enabling him to devote all his time to reflection and contemplation in preparation for the great work which lay ahead of him. This is a most significant contribution she made to the work of her husband as messenger of Allah. 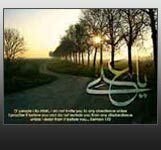 The marriage of Muhammad and Khadija was also blessed by the birth of their daughter, Fatima Zahra. She was the light of the eyes of her father, and the future Lady of Heaven. The father and mother lavished their love on her, and she brought hope and happiness and the mercy and blessings of Allah with her into their home.